Delfina Muñoz de Toro has spent years traveling the world to study ancestral cultures and to visit artisans and healers who have inspired her own work in both music and painting. 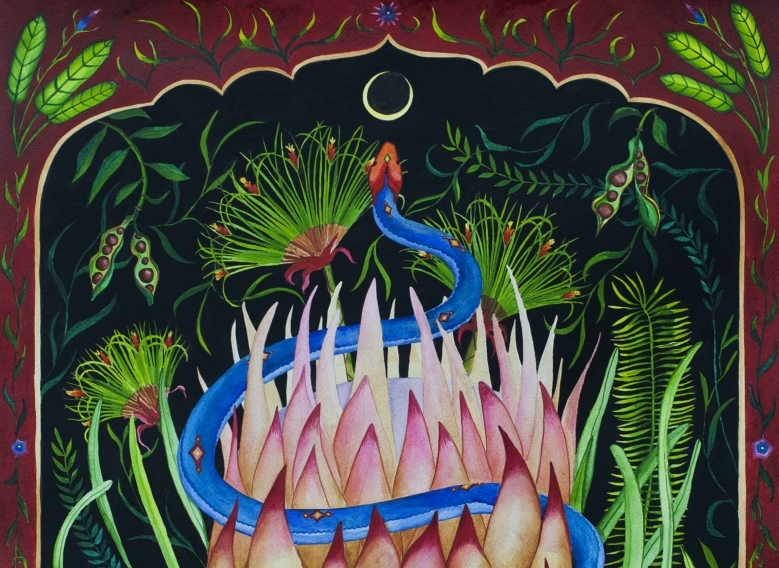 She has dedicated her practice to living with communities that carry the teachings of Amazonian peoples, learning from their lineages to inform her visionary paintings and songs. She has worked closely with Brazilian indigenous cultures including the Katukinas, Huni Kuin and Yawanawa peoples of the Amazon. She is one of four artists whose work will be shown in an exhibition entitled Gäa: Holistic Science and Wisdom Tradition at The Exchange in Penzance (16 February to 18 May). The exhibition explores the traditional ecological knowledge that survives in indigenous cultures and re-imagines the earth as a living organism, with all forms of life entangled in a fabric of relations. At CAST, Delfina Muñoz de Toro will share her extraordinary experiences and knowledge in conversation with Gina Buenfeld, curator of the exhibition, and give an acoustic performance involving voice and the charango, a classical guitar. This special evening will also include a screening of films from HIBRÍDOS, a filmic archive of musical rituals from the spiritual traditions in Brazil, produced by Priscilla Telmon, Vincent Moon and Fernanda Abreu.